These are Australia’s iconic flowering trees, and Corymbia ficifolia (formerly Eucalyptus ficilolia) are commonly called flower gum trees. 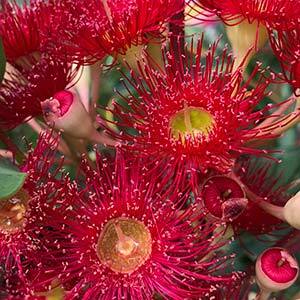 They are the most widely grown of the ornamental eucalypts, and Corymbia ficifolia, or red flowering gum trees are available in grafted and dwarf forms that make them a most attractive small tree for the home garden. Grown as street trees, in the home garden as well in parks across the country, when in full bloom, covered with masses of flowers Corymbia ficifolia is spectacular. Although the main flowering period is summer through to autumn a few spot flowers will appear during winter, a wonderful sight on a cool winters day. As the weather warms up they really hit their stride and the dense crown becomes a sea of red. The species itself is variable, different flower colors, and different heights, so growing from seed is a bit of a lottery. However the modern named cultivars, many which are grafted are much more uniform in height and color, They are also hardier and better able to cope with a range of soil conditions. The new dwarf cultivars are increasing popular with home gardeners as well as for use as street trees. These varieties will reach around 3m in height and make excellent trees for smaller gardens. 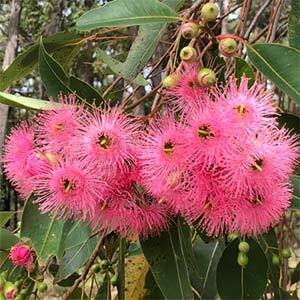 Although this wonderful flowering tree is sometimes called ‘bloodwood’ tree, this is a term that can refer to many Corymbia species, so it is potentially misleading. Grafted forms of Corymbia ficifolia (many using Corymbia maculata rootstock) are becoming popular in the eastern states are they are more tolerant of the eastern climate and soil. A well drained soil is essential to promote good growth, wet or clay soils are not suitable. With a well drained position and ample sun Corymbia ficifolia will form a dense well formed crown and will flower prolifically. In poorly drained clay soils growth tends to be straggly at best. Eucalyptus preissiana or Bell-fruited Mallee. A small growing tree with large yellow flowers from Spring to Summer. 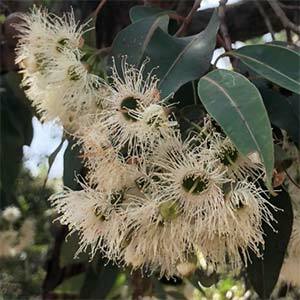 Eucalyptus caesia A lovely upright tree with long weeping branches, from Western Australia flowers from Autumn to Winter.